We manufacture and supply the high quality of Flame Arrester. 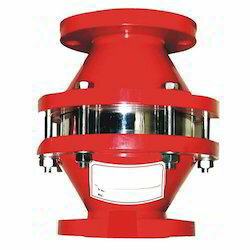 Flame Arrester are safety devices mounted on the chemical storage line & ducts carrying flammable liquids, vapors & gases. The Flame Arrester could "IN LINE" or END OF LINE" & classified as Explosion proof or detonation proof. The internal element is made of metal sheet, the gas in allowed to pass along with the element which prevent fire entering in process on the event of external fire Flame BANK is so designed that pressure drop is negligible with reference to API 2000. Temperature sensor may be install in order to detect flames & to initiate counter measures to extinguish to fire could "IN LINE" or END OF LINE & classified as to assist your requirement the details such as fluid / gas vapors contains Tank size / capacity in liter pumping rate in & out from the storage tank to be specified. Looking for Flame Arrester ?